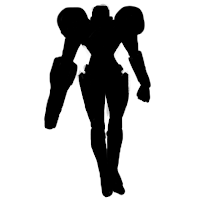 A silhouette is the shape an object, or in our specific case, a character makes. As human beings our ability to recognize those shapes quickly and easily is one of the things That’s helped cement us so high on the food chain. Have you ever been caught off guard by a shape that looked like a person, jumped into action only to realize it’s a cast shadow on the wall? Or remember as a kid, your imagination would turn a pile of clothes into a life threatening monster? THAT, my friends, is the power of silhouettes! As visual artists it’s our job, no; our RESPONSIBILITY, to take advantage of this powerful built functionality of our brain! And as the guy writing this it is my job to show you how. 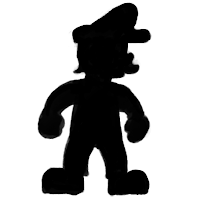 Yeah, its a little shaky, but it is Mario. Okay… and who is this? Yep, Its Link from The Legend of Zelda. Samus Aran, the worlds more dangerous bounty hunter! 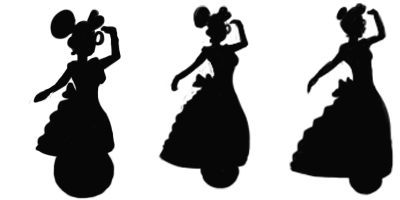 So I'm guessing for most of you these silhouettes were immediately recognizable. Even if you didn't get the names right, after playing a few round of Super Smash Brothers these iconic shapes would be cemented in your mind. Let’s go through a few more. Who are these characters? Do you recognize any of them? You probably do! Silhouettes are so powerful because the human mind is specifically designed to recognize and categorize these shapes very quickly. If you want to create a memorable character, and you should, then one of the first steps is thinking of a unique iconic shape to help separate your design from the crowd, regardless of your art style. Get creative with it! Grab a brush tool and an eraser tool if you have access to digital painting software or if you don’t just a pencil and regular eraser! Start with shapes and make them look fun and unique! A lot of professional artists use a method like this to quickly create a lot of variation and variety in their designs for both personal and client work. 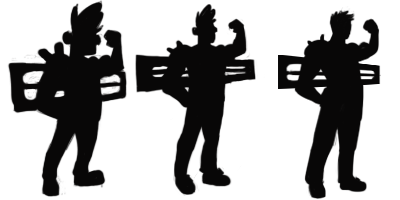 Another big benefit of strong character silhouettes is recognition. As long as you keep the same shapes in the same order you can drastically change the proportions and still have your character read the same way. You can quickly notice you favorite characters in completely different styles because of this idea. Here are some of my own characters from an upcoming comic project to help illustrate these points. 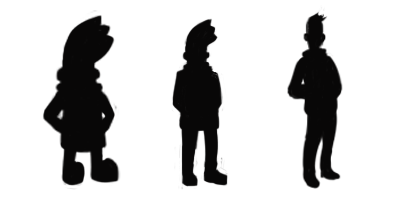 For each of them on the left you have a hyper stylized version with shorter limbs and exaggerated features, On the right there are more realistic proportions, but still a lot of focus in capturing the elements that make their silhouettes stand out. and in the center is kind of mix of the two, the style I'm going to be doing the comic in. Next week we will be looking at different ways to fill in your unique silhouettes to help them stand out even more! 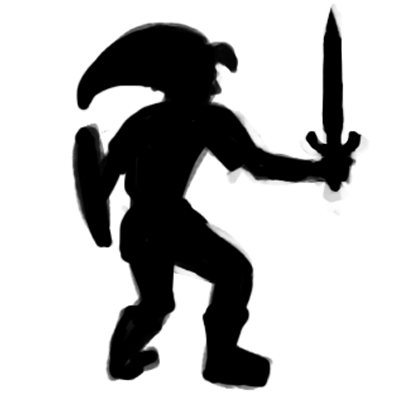 What is the most recognizable character silhouette? I mean if you've been following my posts here at all then you know I'm a HUGE Samus fan. Samus' Varia suit has always stood out to me as a very iconic character design. In a post World of Warcraft world before the giant pauldrons were standard on any character with armor; Samus' were, pun intended, huge. Who are some of your favorite character silhouettes, which ones stand out to you the most? Let me know down below.